Chinese President Xi Jinping and his BRICS counterparts from India and South Africa, Pranab Mukherjee and Jacob Zuma on Saturday attended a grand military parade held in Moscow to mark the 70th anniversary of Russian victory in World War II. The BRICS leaders, hosted by Russian President Vladimir Putin, were among more than 20 leaders of countries, regions and international organizations, including UN Chief Ban Ki-Moon to attend the commemorative event. Although most western leaders stayed away from the celebrations, German Chancellor Angela Merkel will travel to Moscow on Sunday to attend a wreath-laying ceremony. On Saturday morning, eight guards of honor marched into Moscow’s Red Square carrying Russia’s national flag. In his Victory Day speech, Putin said “in the 1930s, the enlightened Europe failed to see the deadly threat in the Nazi ideology”. “The Soviet Union bore the brunt of the enemy’s attacks. it is no surprise that it was the Red Army that, by taking Berlin in a crushing attack, hit the final blow to Hitler’s Germany finishing the war. They liberated European nations from the Nazis,” Putin told the gathering at Red Square. Putin also criticized what he called, “attempts to establish a unipolar world” in recent decades. “In the last decades, the basic principles of international cooperation have come to be increasingly ignored. We saw attempts to establish a unipolar world. We see the strong-arm block thinking gaining momentum,” he added. 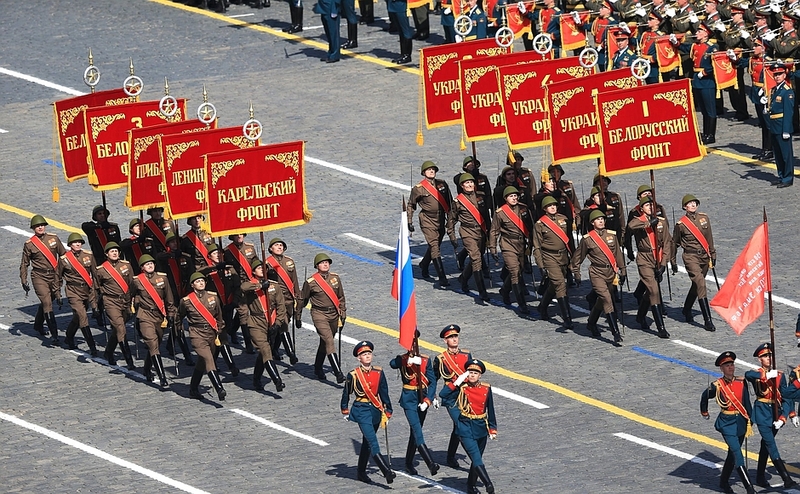 About 16,000 servicemen, marched into the Red Square proudly in many formations. Chinese and Indian guards of honor also marched through the Red Square as part of Russia’s military parade on Saturday. This was the first time Indian and Chinese soldiers participated in a Russian Victory Day parade. President Xi Jinping waved to China’s guards of honor, consisting of 102 members, that joined the parade and marched through the Red Square. Putin also praised the bravery of Chinese and Indian soldiers in the war. “These also include servicemen from China, which, just like the Soviet Union, lost many millions of people in this war. China was also the main front in the fight against militarism in Asia. Indian soldiers fought courageously against the Nazis as well,” said Putin. Putin and Xi, along with other leaders, walked to the Tomb of the Unknown Soldier to lay red flowers in salute to the soldiers who sacrificed their lives in the WWII.